Having sailed in Hawaii for over 40 years, we’ve seen Maui gradually change and grow in many ways. For as much as the island has changed, however, one thing that has remained constant over the years is the art of sailing in Hawaii. The slap of water lapping against the hulls still sings its romantic song, and the feeling of harnessing the island tradewinds still calls us to the water each day. The Hawaiian Islands, however, can be difficult for sailing, and it's been said that if you can sail in Hawaii then you can sail almost anywhere in the world. As evidenced by the wind and weather conditions in Maui, the direction and strength of the winds in Maui is highly nuanced and variable. In fact, the winds in Hawaii are so specific, and each with their own particular traits, that the ancient Hawaiians had over 30 names for the winds on the island of Maui. When you factor in other variables of sailing, such as the movement of the currents, the direction of swells, and the evening rotation of the stars, it's easy to understand why the Polynesian navigators were considered some of the best in the world. Today, during our sailing tours of Maui and Lana‘i, we are humbled to follow in the Hawaiian tradition of connecting these islands by sea. Our Trilogy catamarans are of sloop rig design—meaning they use a mainsail and single headsail—and their stable structure is the modern equivalent of traditional Polynesian voyaging canoes. The nice part about catamarans is they provide a comfortable platform for sailing in between islands. The difference between a catamaran and a monohull, however, is that the point of sail is a little bit different for catamarans than it is for narrower boats. For example, during our sailing tours of Maui, our catamarans will often sail on a reach and are very rarely close-hauled. In layman's terms, this means that the wind is blowing over the beam of the boat (the side of the boat), and in certain situations—such as a downwind sail from Honolua Bay—we will sometimes end up running free with the wind blowing directly behind us. What is the Best Place for Sailing in Maui? 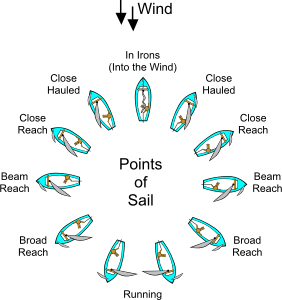 As any sailor will know, the answer is one that is constantly changing and ultimately depends on the wind. Here in the islands of Maui County, the prevailing wind direction is from the NE quadrant about 80% of the year. 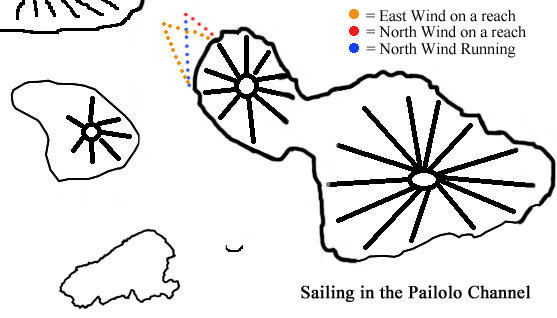 These are what are famously known as the "tradewinds," although wind from the north versus wind from the east can have a dramatic difference on where you set sail. The Pailolo Channel is the waterway that separates the island of Maui from Moloka‘i. Tradewinds from both the north and the east will regularly blow through the channel, with the mountains of West Maui and eastern Moloka'i creating a funnel 9 miles wide. Of all our sailing tours on Maui, the Pailolo Channel offers the most consistent sailing— particularly during the summer. During both the northerly as well as easterly trades, we will usually set sail from Honolua Bay on our Discover Ka'anapali snorkeling tour. Sailing on a beam reach towards Eastern Moloka'i, we will jibe the boat in the middle of the channel to begin sailing back towards Maui. On an easterly tradewind this will often mean sailing on a beam reach, with the boat now positioned on a port tack (wind blowing over the port side of the boat) versus the starboard tack taken towards Moloka'i. On a northerly tradewind, once we have jibed the boat mid-channel, the northerly direction means that the wind will be passing directly over the stern of the boat. This position is called "running free," and while it is technically regarded as the slowest point of sail, the consistent 15-25 knot tradewinds still make for a riveting sail. Between Maui and Lana'i the winds get a bit more complicated. On a north wind, for example, you can set sail out of Manele Harbor and then sail on a reach nearly all the way to Lahaina. Northeast winds offer a similar sail, although you will often begin to lose the wind a few miles out from Lahaina. On an east wind, however, the Auau Channel can be very confused and the wind speed can be very blustery. Reaching Lahaina on an east wind would require a lengthy series of tacks, and even though we will still sail on east winds off of Lana'i, it's often better to find a convective breeze off the distant shoreline of Lahaina. Unlike the tradewinds out of the north or the east, a convective breeze is a light sea breeze caused by the heating of the land. These convective winds are perfect for a casual sail along the coastline, and we will usually use a drifter sail (which is similar to a spinnaker), to catch the breeze passing over our stern for an enjoyable downwind sail (drifters and spinnakers can only be used downwind). Finally, on the rare days when we have kona winds blowing out of the south, the downwind run back towards Lahaina is perfect for the colorful drifter. On the south side of Maui, Ma‘alaea Bay is one of the windiest spots in the entire state of Hawaii. Since Maui's two volcanoes— 5,800 ft. Mauna Kahalawai and 10,000 ft. Haleakala— create a valley in the center of the island, this valley essentially acts as a wind funnel that spits out wind over Ma'alaea. On over 300 days out of the year, Ma‘alaea Bay is a sea of whitecaps from about 11 am- 6pm. While both a northerly wind as well as an easterly wind will eventually stretch all the way down the coastline, a northerly wind will arrive earlier in the day and render snorkeling at Molokini impossible. 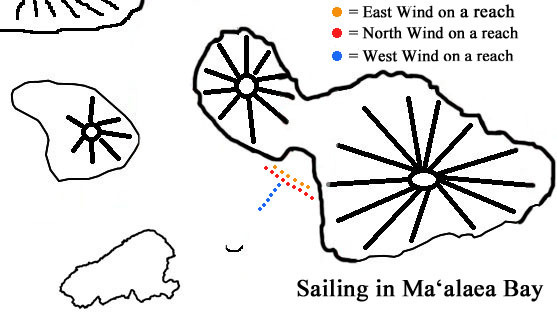 For sailing, however, reaching Ma'alaea Harbor from Molokini or Makena would require sailing directly upwind...something that we know isn't possible to do. Rather than enduring over a dozen short tacks and zig zagging our way upwind towards the harbor, we will often motor up the coastline of Maui, hoist our sails off of North Kihei, and sail on a reach on a starboard tack past McGregor Point at Ma'alaea Harbor. On the rare occasions with kona wind days or light westerly breezes, we can often sail on a port tack directly towards Ma‘alaea Harbor. Where sailors need to be careful, however, is that the light, 10-knot westerly breeze can easily change to a 25-knot easterly breeze at an area off of North Kihei. When sailing in Ma‘alaea Bay, it's always important to look ahead at the wind line since the wind strength can switch at any time. The reality, however, is that studying Maui and her fickle winds on paper will only get you so far. To really learn about sailing in Hawaii you need to let the breeze blow through your hair and feel the wind on your face; hear the slap of the waves on the hull and the whistle of wind in the rig. This has been our passion in Maui since 1973, and we always love to swap a good tale with fellow island sailors.